The Ohio State University Melton Center was the first center for Jewish Studies at an American public university. The center develops, promotes and supports teaching and research in Jewish Studies by faculty and students; actively encourages the study of all aspects of the Jewish experience; and sponsors educational programs that serve the public. Our Jewish Studies Program is one of the largest and most respected programs in the United States, and our faculty members are internationally recognized scholars in their fields. 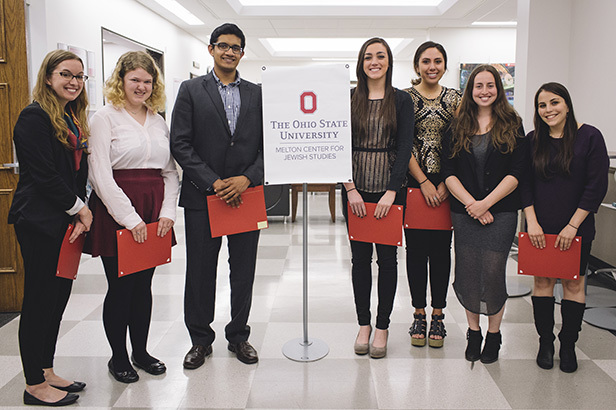 Students choose our Jewish Studies Program for the variety of courses, the many events and the vibrant Jewish life at Ohio State and Columbus. The Melton Center offers generous scholarships, grants, and awards to high-achieving undergraduate and graduate students to encourage excellence in Jewish studies. “The Melton Center has played an influential role in my college experience and has allowed me to gain a greater interest in Jewish Studies more than I ever expected. Through the diverse course offerings, talks and other opportunities provided by the Melton Center, I have grown both intellectually and professionally,” said Rachel Lieberman, Jewish studies major; psychology minor. Jewish Studies at The Ohio State University comprises one of the largest and most diverse programs in the country, offering an impressive selection of courses, a multidisciplinary faculty, and a wide range of events. Melton faculty are internationally recognized in their respective fields, including History, Philosophy, Political Science, Music, English, Near Eastern Languages and Cultures, Germanic Languages and Literatures, Classics, Art and Education. The Ohio State University has one of the largest Judaica library collections in the country, with a full-time Judaica librarian and over 300,000 volumes. About 1,200 students from numerous backgrounds and orientations take Jewish Studies courses at Ohio State each year. The program prepares students to carry the lessons and values they learn here throughout their lives and to create a positive impact on their future. The Melton Center also sponsors students who wish to study abroad in Israel, Eastern Europe and elsewhere. We offer graduate fellowships and student awards for excellent work. They enrich the campus and community by bringing outstanding scholars and programs.